There was a time in my life when drawers were not that important - when, in fact, they were something I didn't even give a thought to. Something I disdained. I didn't need them. I also did not need or want doors for my kitchen cabinets. Everything was out in the open. I was so cool. I bought dishes that matched the kitchen decor, so why not show them off? I only bought food in containers that looked good against those visible inside walls. It was all very Martha Stewart-y, but in a cooler way. A more shabby chic thing. A thing that grew old fairly quickly. There were problems - like the fact that I like Campbell's Cream of Mushroom soup, but the red & white can just didn't go with the colors in my kitchen. Ditto Zesta saltine crackers. More red. So I got really crazy for a while & bought containers to put that stuff in, containers whose colors did go with my kitchen colors, but then I'd forget what I had. Out of sight, out of mind. After a bit, I had doors put on. Much better. Not looking at a cluttered cabinet is a highly underrated thing. During this period of hiding things, I'd discovered the wonder of drawers. What an amazing concept. You can put things in drawers & close them & voila! Secrets. But I wanted the insides of the drawers to look good. So I began to color-coordinate those, so that when I opened a drawer, I would actually feel good about searching for my voter-registration card, or incense, or batteries. I painted the insides of all my drawers. I only bought things that - you guessed it - kind of matched. Nothing neurotic about me. But you know what? It makes me happy to open a drawer & see dvds all in white sleeves, laid against a baby blue napkin, inside a pale teal drawer. It makes me happy to see the edges of the drawers when they're left open. It makes me feel organized & together, even if I'm not. I'm still searching for the perfect thing in which to toss mail as I come in the door. I've looked for years, but can come up with no solution I actually follow. Sometimes I pretend I'll go through the mail the day I receive it & throw out what I don't need. Ha! I have no secrets about my mail - it's piled everywhere. I did, however, just buy a straw & teal colored purse/tote that looks large enough to hold a lot of bills. It matches. A possibility. I'll let you know. HA! A kindred soul....I think it might be heridatary. My mom, whoes house can look like a cyclone went thru it will proudly show ANY visitor her bedroom drawers, where everyting is neatly and prettily organized. My house frequently looks like a cyclone (or a bunch of boys) went thru it and my closet will always be organized with matching wooden hangers, color coordinated and matched by style, item and season. (I checke dout my brothers closet a few years ago and move 2 things, his wife looked at me and said, "he's not going to like that" sure enough, 10 min. later he comes into the kitchen "Who messed up my closet?" I perfer not to go into the deeper reasons, but yes Debi, I like being happy when I open my drawers too. Paula - !!!! You are too funny! yes debi dear girl notifications of comments come directly to my e-mail and i am so happy i can help your belly ache! now i am going to catch up with your last 2 posts. i savor each and every one. p.s. do you also get email notification of comments? because last week i started leaving you comments on posts that are from 'the early days.' some are so early that no been commenting yet :) and i loved them all!!! Robin - Yes I DO get email reports of your comments (& everyone elses's). And yes, you ARE funny! My place is very organized and simple. No clutter. Except (there's always an exception) for the hall closet. It's where I put the stuff that has no place. It's where I put all my papers...mail, phone book, important forms, cards, etc. No matter how hard I try to keep this closet organized, things pile up, and then the job of organizing it seems so huge, that it keeps piling up until it drives me so crazy that I spend the entire afternoon discarding the crap and organizing the essentials. Reading this post makes me want to make this closet pretty to look at. I think I need to put my snorkle mask on and dive in. Maybe if I try to make it look nicer, instead of just organized, I will be more inspired to keep it looking that way. It just might work...thank you! now it is very late...the middle of the night even and i am finally here to actually comment on this post of your rather than comment on your comments on my own blog...sheesh how self absorbed can one person (me) be? anyway... this is one of your best!. best what you might ask. essay on the life of a texas girls' art and anxiety i guess. you tell it so...straight faced is the word that comes to mind... it made me laugh. and one of the best literary aspects of this piece (in my humble opinion) is that it has universal relevance. who can't relate to neurotic housekeeping habits? yours by the way sound completely 'artistic' and i for one would like to emulate your style. i did some of those very 'cool' strategies over the years but i never ever painted the inside of my drawers! awesome suggestion. Jaime & Robin - I was once, a million years ago, watching the Martha Stewart show (pre-prison days) & she was showing off her house. Now Martha drives me crazy, but she DOES hire great photographers, and she DOES like the same colors I like, so I feel some odd neurotic kinship with her. I understand her need to control everything, and her desire for perfection. ANYWAY, on this one particular day, there was a room in her house she didn't want the cameras to show. They talked her into it & it was a MESS! It was kind of an office/workspace & it was piled & cluttered with samples of this & pieces of that & lo & behold, she turned out to be human! Of course, it was piled & cluttered with COOL stuff, but even better, as far as I was concerned. At least it still kind of MATCHED! LOL! you never know when one of your postings is on someone's mind, clear across the world. Julie - I'd read your about drawer painting, and it made me smile because 1: I'd already taken this photo & was just saving it to talk about later, and 2. My friend Katie has been working on 27 drawers for quite a while now. 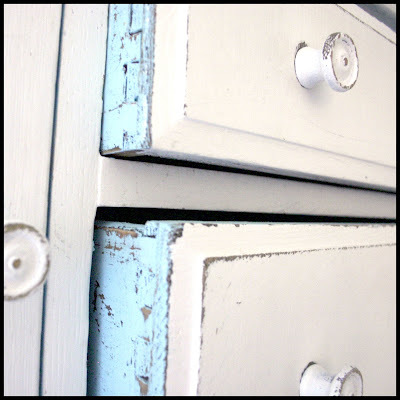 Drawers that have had to be stripped of multiple coats of the worst kind of paint, sanded, etc., etc. & she is ready to just burn the things. Every once in a while I see another one in the back yard where she's working on it & I just have to smile. If I were YOU, I think I'd take a breather. You can always do one at a time if you decide to paint.